That middle-of-the-night trickling sound from the bathroom toilet is not only annoying, it's wasteful and will wind up costing you money on your water bill. Here's some advice to help you fix this common toilet issue. Toilets are one of the most over-looked and underappreciated household fixtures, until a plumbing issue arises. Problems with your toilet can cause both extremely inconvenient and costly situations, such as an unusable bathroom or a high water bill. 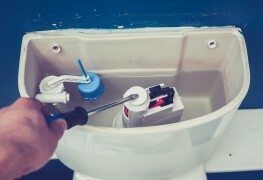 If you have a leaky toilet, or one that’s always running, you may be able to fix it with some fairly simple maintenance. Here's how. First, remove the lid of the toilet and check to see if the chain has fallen off or is broken. Then, try adjusting the length of the chain by moving the hook or pin down a few links. If necessary, you can trim the chain using a pair of wire cutters. A chain that is too long can get stuck in the flapper valve or rest on the bottom of the tank, which causes water to continually drain. Shortening it should eliminate this issue. If adjusting the chain didn’t make any difference, you should try replacing the toilet flapper. First, turn off the water supply valve and remove the chain connected to the flapper. Then, pull both sides of the old valve off the overflow tube and replace it with a new one. Check the existing valve for signs of wear, rust or damage. These are things that can cause your toilet to run continually. Before buying a new valve, remove the existing one and take it to the hardware store with you. This will help when you are trying to figure out which part to purchase. You should clean the seat of the flush valve to make sure that your new toilet flapper will seal properly. After you replace the old valve, you should test the new one. Attach the lift chain, turn on the water supply valve, watch the tank refill, and test the flush cycle. The flapper valve is something that needs to be replaced from time to time due to normal wear from underwater submersion. However, harsh chemicals such as those from drop-in cleaner tablets can cause damage that may require more frequent replacements. To see if your stopper needs to be replaced, try adding a couple of drops of food colouring to the cistern. If it ends up in the toilet bowl, it should be replaced. 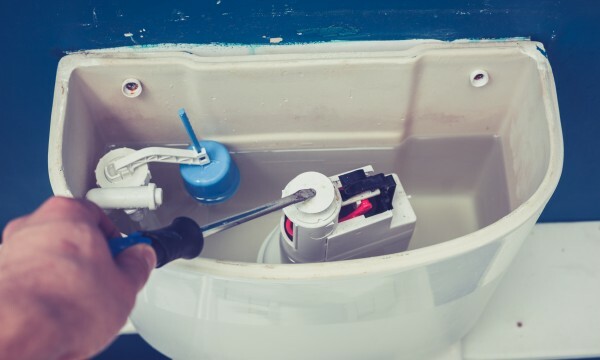 If you’ve checked the toilet chain and flapper, and neither of these parts need to be replaced, you may want to inspect the float in the toilet’s tank. To adjust the height of the float, turn the adjustment screw on the float arm with your screwdriver. This will lower the float or float ball and in turn, lower the water level. Check to see if the water level in the tank is one- to one-and-a-half inches below the top of the overflow pipe. If it’s higher, you’ll need to adjust the height of the float. If none of the previous steps have worked to stop your toilet from running, you may have a faulty fill valve that needs to be replaced. First, turn off the water supply valve and empty the tank. Next, remove the old valve by pulling up the lock ring, removing the refill tube, and sliding the valve off the base. Then replace it with the new valve in the same manner. Check to see if the fill cup is rising with the water level in the tank. If it’s not, you should replace it. If the base of the fill valve isn’t in good condition, you’ll need to disconnect the water supply line and replace the entire unit. Making these simple repairs on your own, such as replacing a faulty fill valve or worn-out flapper, could save you quite a bit of money on your water bill. The good news is, you can fix your leaky toilet and stop it from constantly running without having to call a professional plumber. National advertising powered by Mediative.com. Yellow PagesTM, Walking Fingers & DesignTM, YP.caTM, Find. & DesignTM, YellowPages.caTM, Canada411TM and YP ShopwiseTM are trademarks of Yellow Pages Digital & Media Solutions Limited in Canada. All other trademarks are the property of their respective owners. Copyright © 2018 Yellow Pages Digital & Media Solutions Limited. All Rights Reserved. Save this business to your address book!